Who says it doesn’t pay to be an NSman? Reservist training and the National Service are a bane of Singaporean males’ existence. We often bemoan the opportunity cost for us as individuals, but it might be helpful to take in a holistic picture of the many initiatives and efforts that the government has put in place to appreciate, support and (some say) placate our sons of Singapore. Let’s start with the most significant benefit (monetarily). 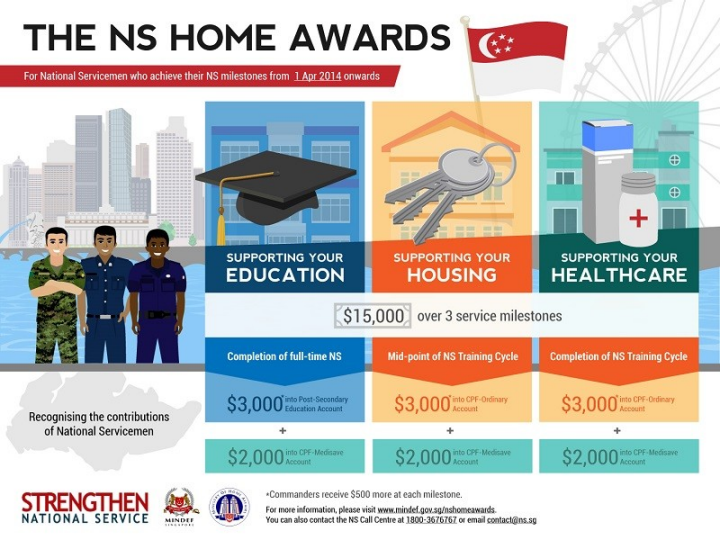 The NS HOME (or National Service Housing, Medical and Education) Awards was launched in 2014 as an enhanced replacement to the National Service Recognition Award. NSmen from all branches of the Singapore Armed Forces and Home Team are eligible. This is done through deposits into the NSman’s Post-Secondary Education Account (PSEA) as well as their three CPF Accounts (Ordinary Account, Special Account and Medisave Account). * National Servicemen with ranks of Third Sergeant and above for SAF servicemen and Sergeant and above for Home Team servicemen receive $500 more at each milestone. The first disbursement into the PSEA can immediately be used to offset the newly operationally ready NSman’s education in approved local institutions. The second and third milestone awards of $3,000 each into the NSman’s Ordinary Account (OA) gives them flexibility to use the money for housing, investments, or other purposes. The $2,000 in Medisave grants is also very helpful to take care of healthcare needs at each of their three NS milestones. One thing every Singaporean son can expect on their birthday is a message from MINDEF reminding them that the window for the Individual Physical Proficiency Test (IPPT) is open for the year ahead. Happy birthday! This is an opportunity to earn some cold, hard cash. Not credits or vouchers. Over an NSman’s 10-year cycle, this amount can add up. Those who consistently attain the Gold standard will receive more than $7,000, while those who pass each time will bag more than $2,000. Not a bad incentive to keep yourself in shape, isn’t it? Some might say going for the full set of 20 Remedial Training (RT) sessions does pay too. But let’s not “aim” to earn that allowance, okay? There are better ways to monetise your time! NSmen who performed well during their In-Camp Training or courses will be presented with up to $200 worth of vouchers so that they could spend with their families. These vouchers could be used on a range of experiences including local and overseas resorts, family-fun activities (to the Singapore Zoo, Night Safari, Universal Studios), as well as gourmet, wellness and even travel. All eligible NSmen receive a base tax relief quantum of $1,500 each year. NSmen who were called up for NS activities in the previous work year (April 1 to March 31), you will receive an additional $1,500. Key appointment holders receive an additional quantum of $2,000. NSmen who completed their ORNS cycle or NS-liable ex-regular servicemen above statutory age of service will be given a base quantum of $1,500. In addition, parents and spouses (who are Singapore Citizens) of NSmen will enjoy a tax relief of $750 each year. As a further gesture of appreciating NSmen, the government has also extended celebratory gifts to NSmen, sharing in the joy of celebrating these important milestones in their lives. Celebratory Gifts consisting of $100 in credits are given to NSmen on the occasion of their wedding or for every newborn child they have. These credits are redeemable from various merchants, similar in usage as those given to NS Excellence Awards. Thus, NSmen who have both types of credits can combine them for redemption. This year (2017) is the 50th anniversary of National Service. The NS50 Recognition Package is for all past and present NSmen (as of January 1, 2017), who will be entitled to $100 worth of vouchers and one year of SAFRA/HomeTeamNS membership. So, who says it doesn’t pay to be a NSman?